India is a handful. There is so much to take in that it will take some time to process – to work out what to make of it all. We approached India with some trepidation. When my fears ran away with me, as they sometimes do, I imagined India chewing us up and spitting us out. I had visions of being so uncomfortable we would end up hating it, and each other in the process. Emma had worries about us all being consumed by stomach bugs and curled up in bed for days on end. These worries were not baseless as they sometimes are. 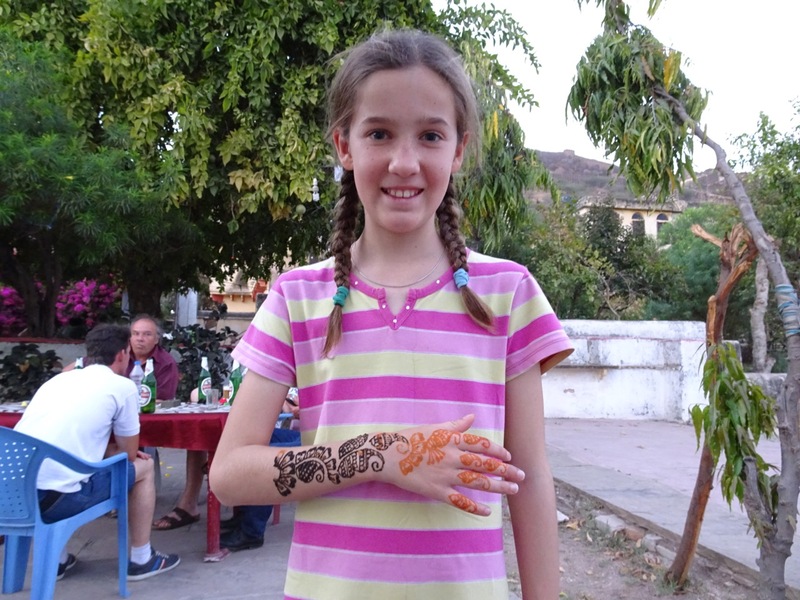 I did visit India with work nine years ago. 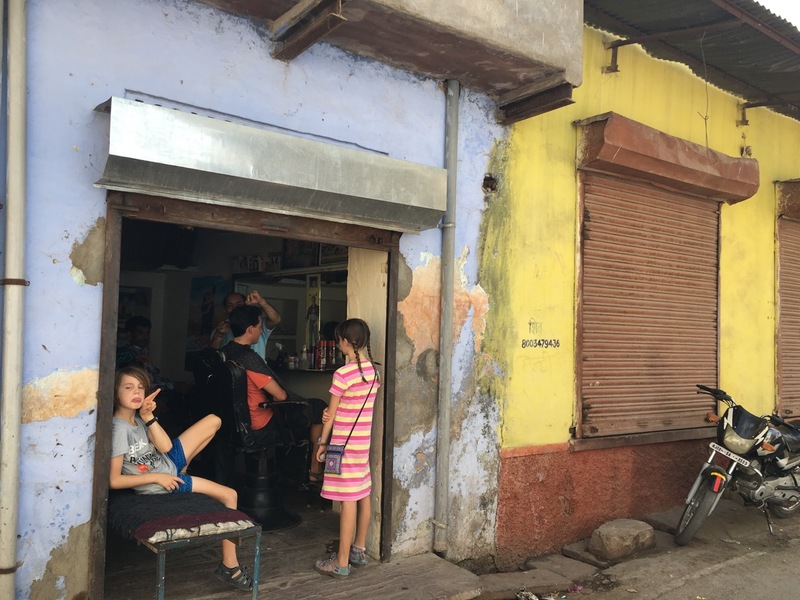 I went to Ahmedabad, where the air quality was so appalling you couldn’t see more 100 metres and where slums stretched as far as the eye could see. Others we meet, that have travelled to India, also invariably have tales to tell about Delhi belly. This however has not been our experience. The sky has almost invariably been blue and apart from the odd rumble, our stomachs have been fine. The place is gritty and dirty and ramshackle and crumbling, but there is beauty in the ruins. 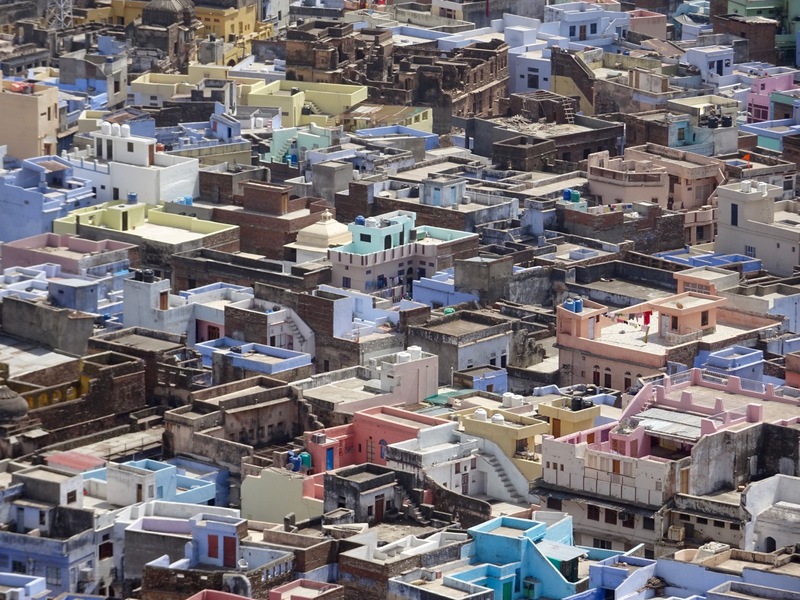 I found it in Bundi, a town of colourful walls settled at the foot of another imposing old palace and fort. 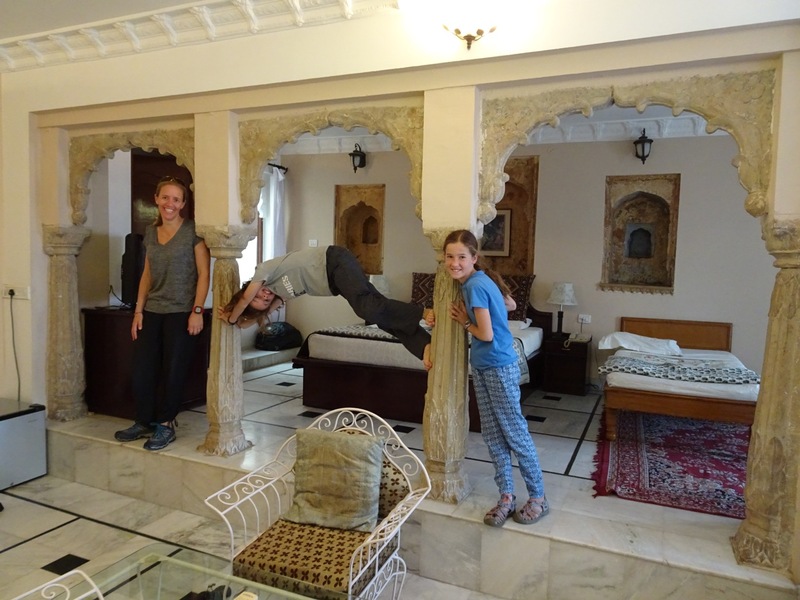 In general, Bundi looks as though it has been constructed from the kind of materials we keep stored in the lean-to at the side of our house. Open drains abound, carrying grey water through a complex mish mash of alleys, lanes and streets. The water drains to a central lake so rich with nutrients it has turned an unnatural shade of green. Sound appealing? It’s not, unless you can also see the beauty it creates. In amongst the drains and flaking walls, there is a texture and colour which is unique and captivating. As we walked the streets in search of step wells, forts and palaces I found myself happily snapping photos of the endless supply of intriguing walls, doors and windows. Every twisting turn presented new and beautiful sights. 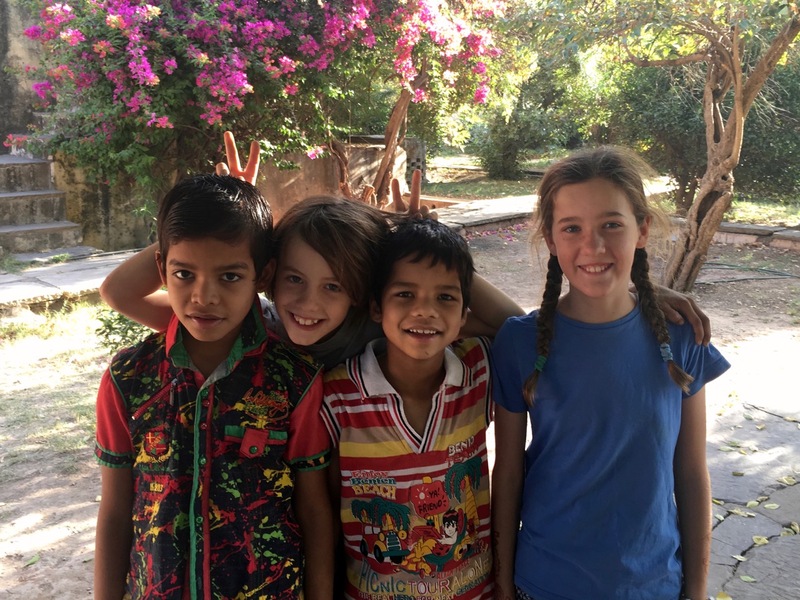 Our little family of four however walked the streets of Bundi and had four significantly different experiences. It all depended upon what caught our eyes and imaginations. 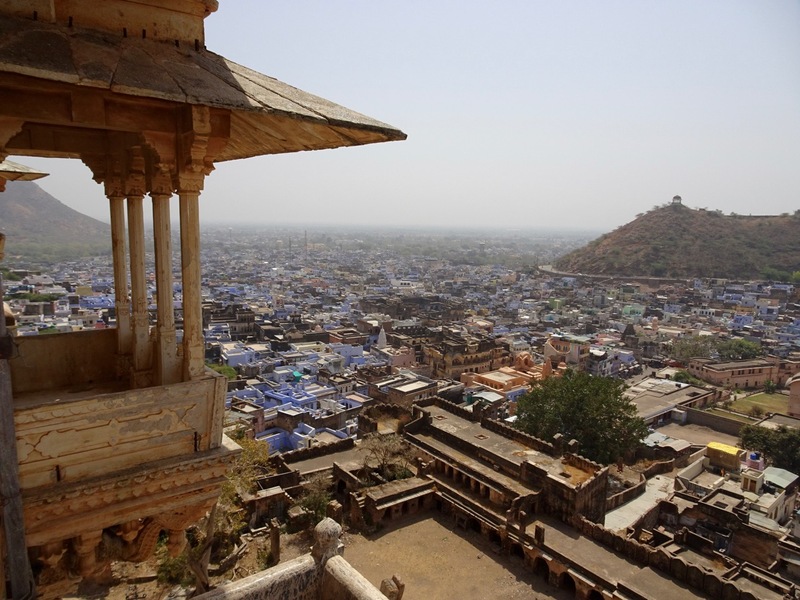 In Bundi I started to revel in our celebrity status. I also begun to feel comfortable, if not at home, walking the streets. 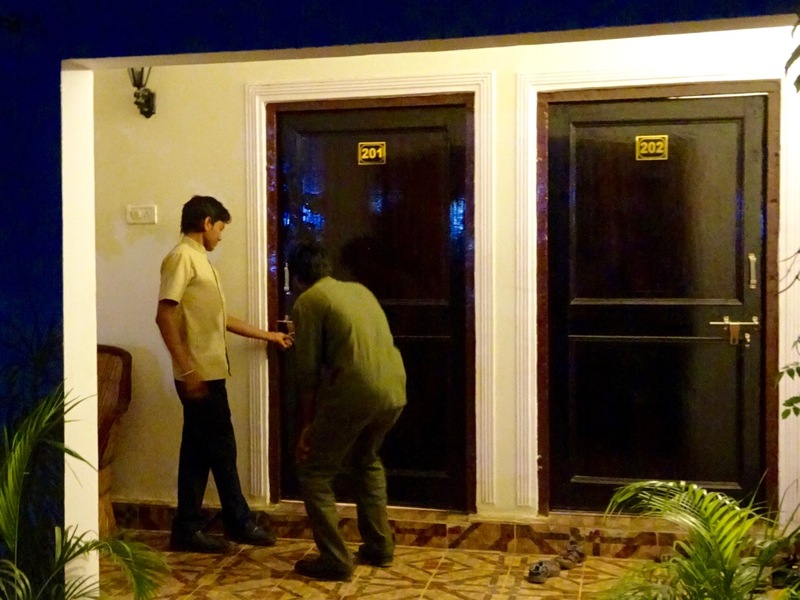 Travelling in India I decided is not that dissimilar to elsewhere, its just not presented in such a glossy package. Not everyone felt the same. Oliver made a throw away comment as we left our hotel one day to the effect of, ‘now I really appreciate good drains’. 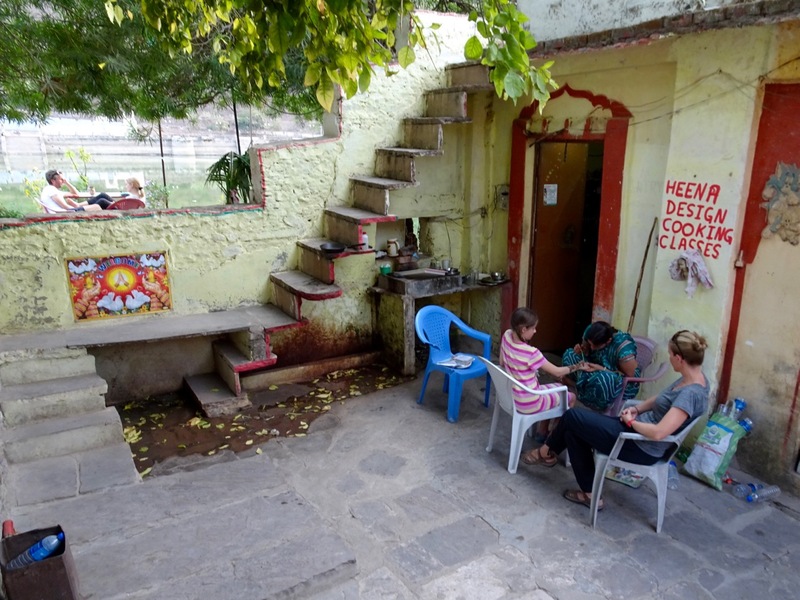 Bundi’s plumbing clearly came as a shock to him and it became a feature of his experience. It will, reasonably, take some time for him to become accustomed to this and for his focus to shift elsewhere. Emma and Amy were still struggling to different degrees with the heat, smells, noise (they really do honk way more than is necessary) and constant attention. The attention we all continue to receive almost everywhere we go is itself an ongoing riddle. 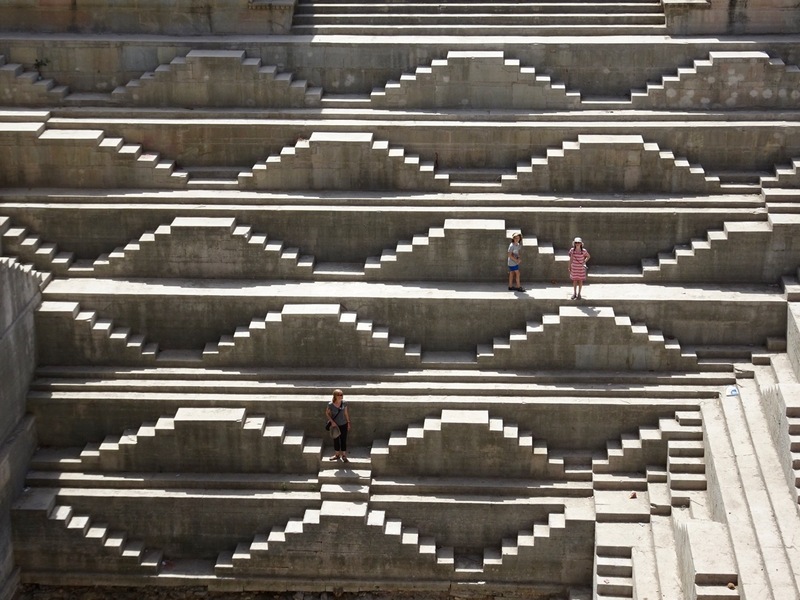 It is almost impossible to know what the basis of our daily interactions with the local people will be. To so many people we are little more than walking ATMs and we have found ourselves on many occasions politely talking our way out of unsolicited diversions into shops, navigating our way out of services we didn’t ask for and studiously, if uncertainly, declining requests for a handout. Not everyone however is out to lighten our wallet. We met some wonderful people who didn’t treat us like a walking rupee. 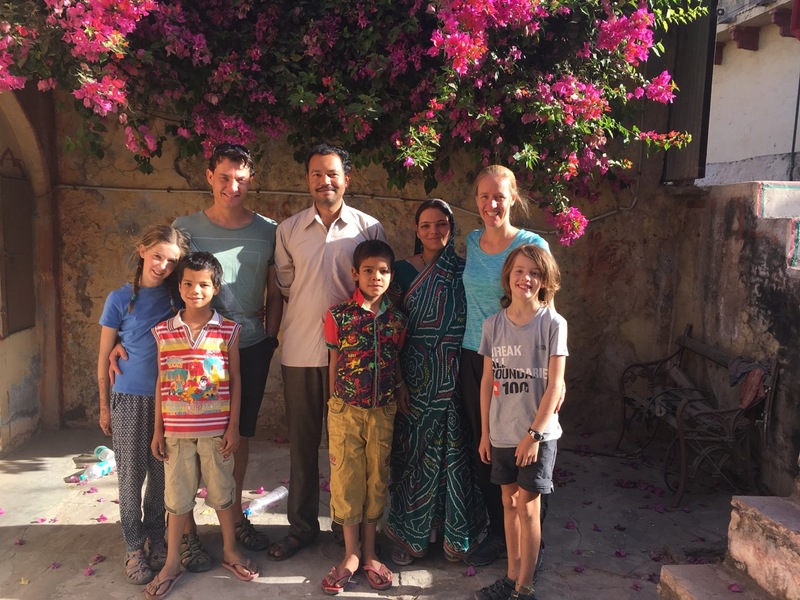 Tony, his wife and sons from the Lake View Garden Restaurant in Bundi were among our favourites. The Lake View Garden is a small place with a crumbling kitchen and plastic tables and chairs weathered by the sun overlooking the unnaturally green lake. The food was incredible and cheap and we ate there three times a day. By the end of our stay Amy and Oliver were roaming the gardens with new friends almost like they were visiting a school mate on a weekend. Tony and his wife were so lovely and so unassuming it was a pleasure to pay over the odds for the food they served. 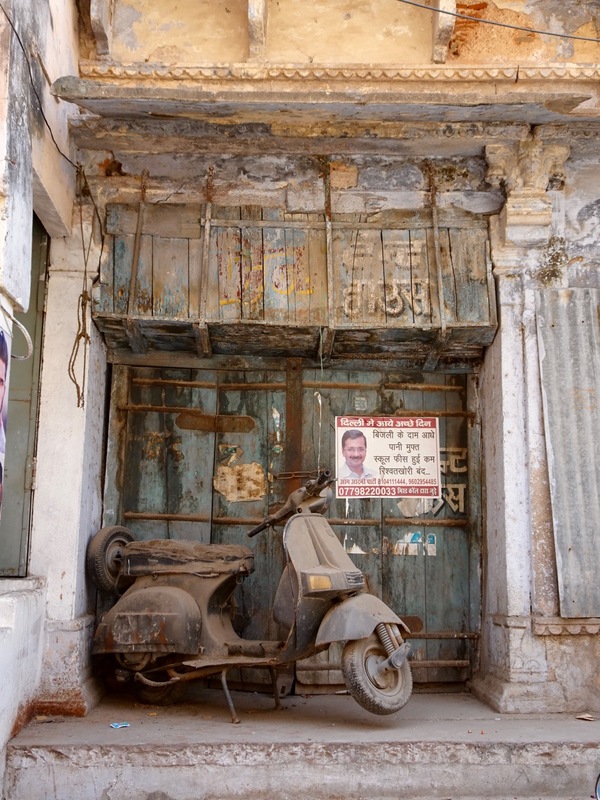 Then there was Mr Kukki and his son Kukki Jnr (aka Bunty) – amateur archaeologists working out of Bundi. 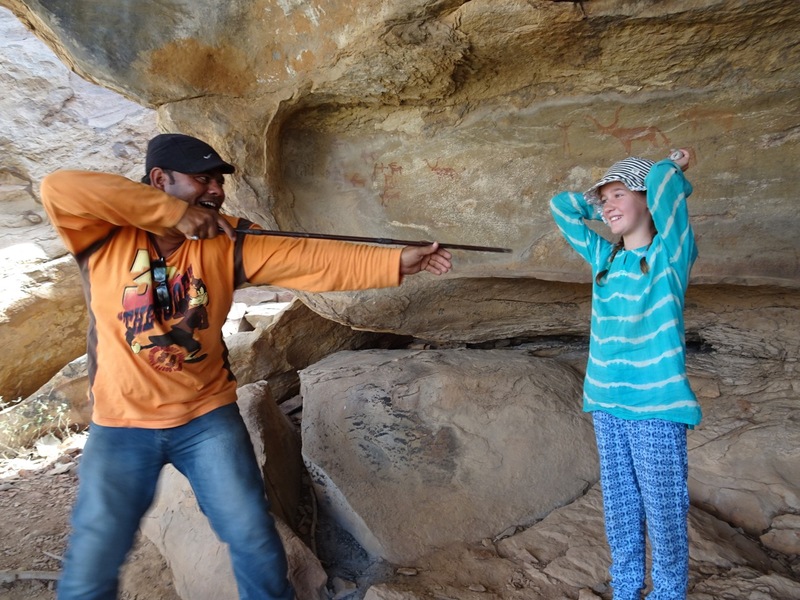 Mr Kukki is globally renowned for his discovery of ancient rock art (think aboriginal rock art such as in Kakadu) in the hills of Rajasthan. His story is a most inspiring tale. In short Mr Kukki moved to India from Pakistan as a refugee. As a young kid he started scratching around in the hills to escape work at his fathers shop through which he built up a handy collection of ancient coins. Not that he knew it. He grew up some more and opened his own highly successful business and became a wealthy man (yep India has them too). His archaeological hobby however proved too much for him and he sacrificed everything he had to pursue his passion. 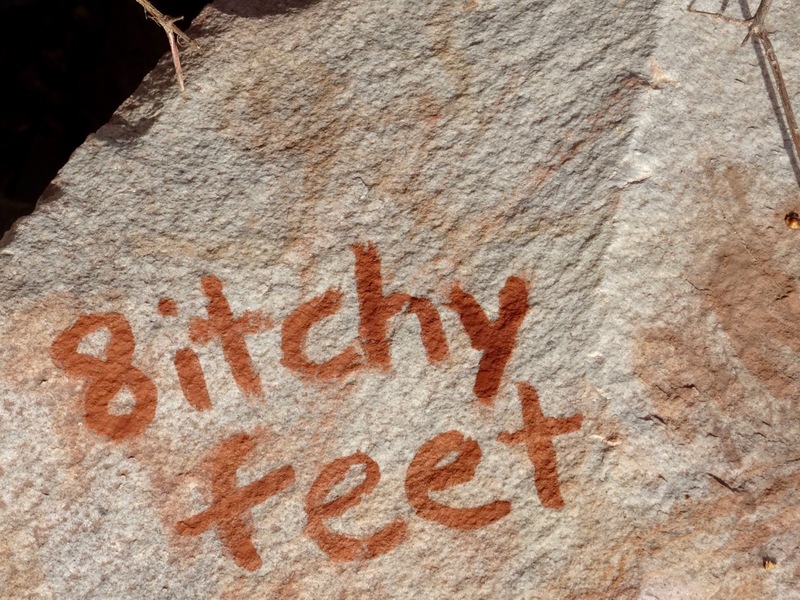 He soon put together a collection of priceless ancient artefacts by scratching around in the hills in withering heat which he then donated to the national museum. He squandered a fortune to follow his passion and just when he had his ticket back to financial freedom he gave it away based on a principled decision that the artefacts he had found belonged to all of India. 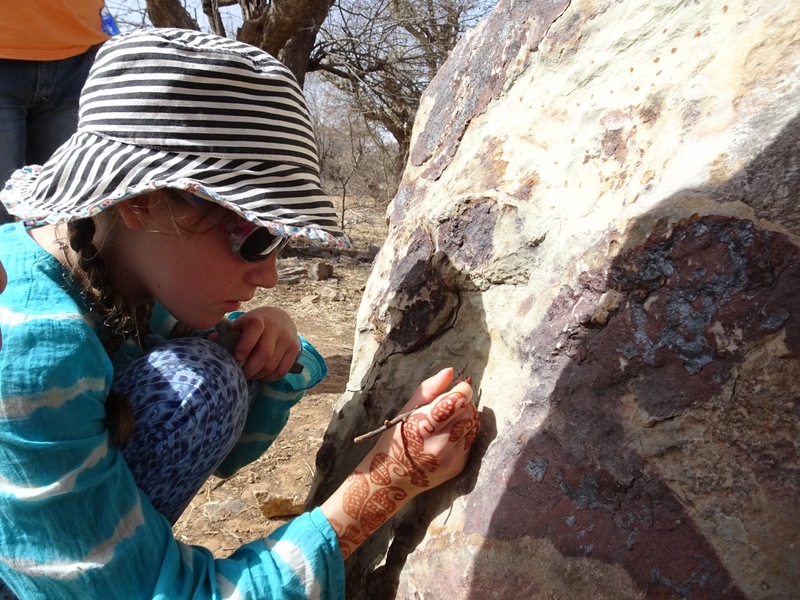 Today the Kukki’s make enough rupees during the tourist season, by showing people like us a few of the ancient rock arts sites, to keep fossicking the rest of the year. When we asked how much a day out with the Kukki’s would cost, Kukki Jnr’s reply was, ‘that’s up to you. I’ll show you around, we’ll have a good day, and then you can give me a few rupees if you like’. It is a tale of dedication, passion and a calling triumphing over self interest. Seldom do you have the pleasure of meeting such a man of principle who purpose in life is more clearly known. What a joy to be doing what you love, loving what you do and content and happy as a result. 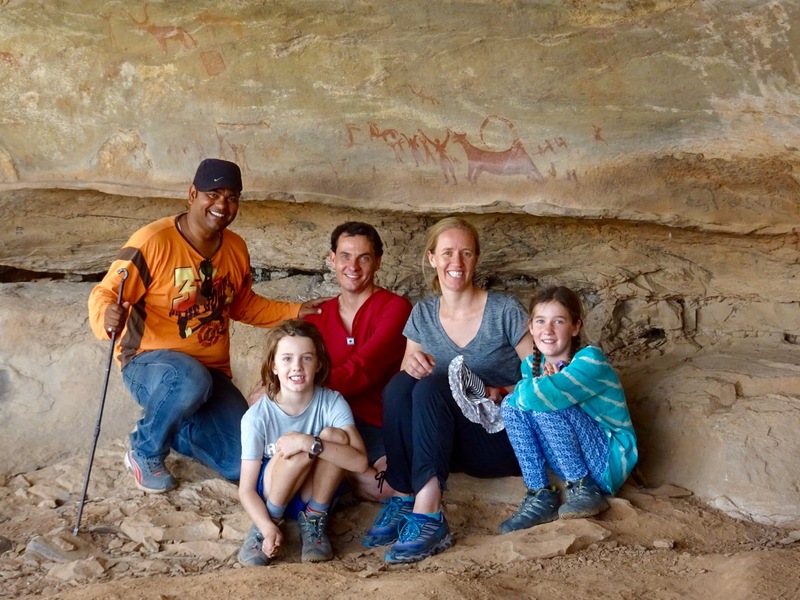 I hope one day to find this too and while I enjoyed the rock art, hidden out in the wilds on the edge of a gorge with vultures circling above, I enjoyed the Kukki’s enthusiasm and story more. Another Indian fellow interested in more than a rupee cut my hair while we were in Bundi. Growing my hair was fun, but I’m over it. I think it was a mild mid-life crisis and a hankering to break out of the Commonwealth Public Service mold, but the reality is it was bugging me. So I wandered into a tumble down little hobbit hole of a hairdressers unsure quite what to expect. The haircut went as expected. A snip here a snip there. It was what followed that no one could see coming. At first I thought the man had mistaken my head for scone dough as he started slapping and pulling and kneading my scalp. Head massage, I soon cottoned on. Nice. Then I felt the strange sensation of fingers twisting in my ears. Did that feel nice? I’m not sure. A face massage, with special attention to the eyes, was followed a shower from a water sprayer which ran all over my face and down the front of my shirt. ‘Does everyone get this treatment?’ Emma asked as she, Amy and Oliver watched on. I don’t think she got an answer before he started on the chiropractic work, grabbing each of my arms in turn and wrenching them back as he simultaneously pushed me forward. An arm massage followed that and a knuckle cracking after that. A few slaps to the head topped it all off. How much I asked him? ‘As you like it’, came the answer. The price of half the services in India is a matter of ‘as you like it’. I paid the equivalent of $3, which according to our driver Naresh was probably about $2 too much, but I’d do it again just for fun! 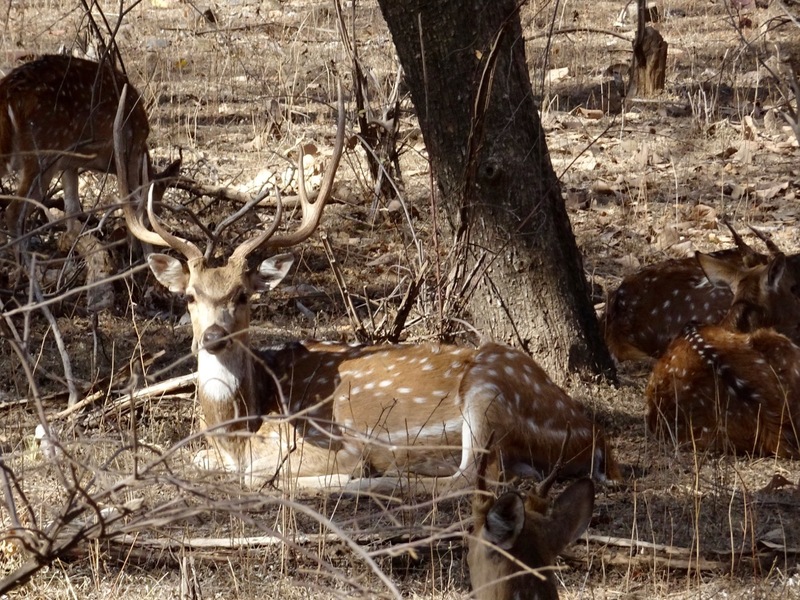 We moved on from Bundi to Ranthambore and the Ranthambore National Park. 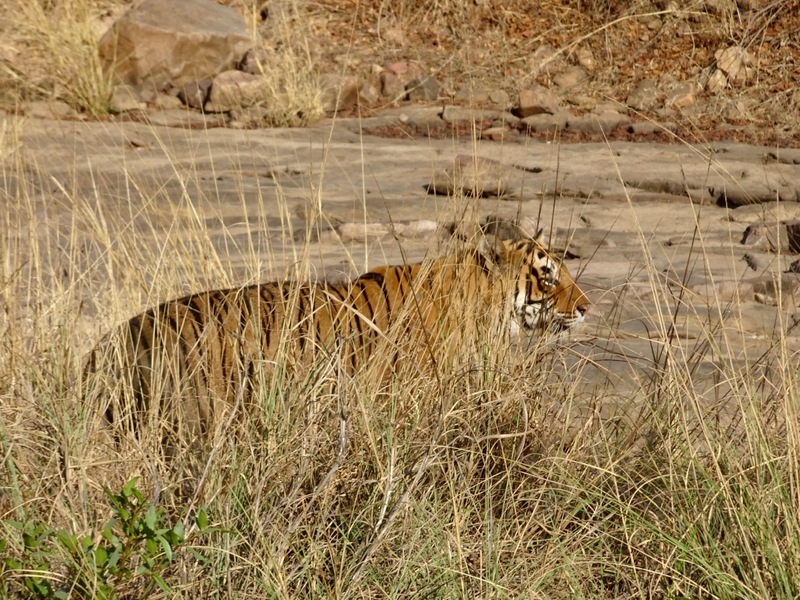 We came to Ranthambore hoping to see a tiger. Not in a cage. Not in a zoo. In the wild. A real, live, wild tiger. Yep, that’s what we came for. We were not however expecting it to happen. 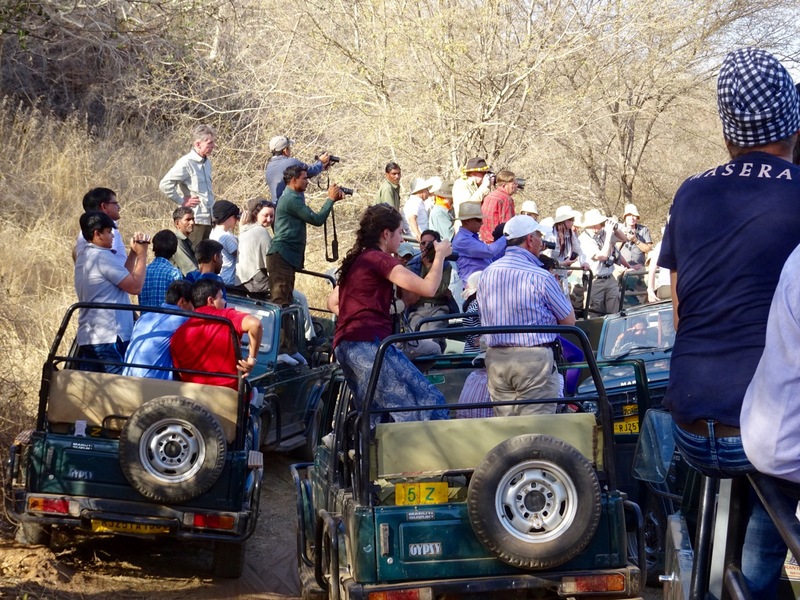 People make many safaris into Ranthambore hoping to see a tiger and while the sightings are frequent enough to keep you hoping, people are more often disappointed than not. We agreed to book whatever safaris were left through our hotel and hope for the best. We had tried to book in advance on line – three hours of Emma’s life she’ll never get back. After checking in I went to pay for a private ‘Gypsy’ (4WD) ride into the park but it wasn’t that simple. An Indian man with limited English guided me to the front door told me to wait and soon returned on his scooter. I got on and off we went, a little nervous because Emma had no idea I had gone. 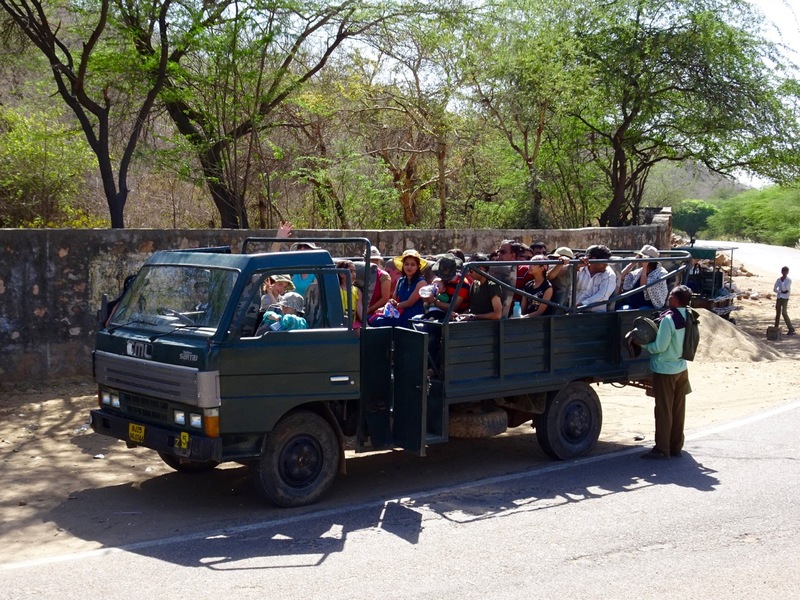 We whizzed through the usual Indian chaos before arriving at the safari booking office, a fair sized concrete building packed full of locals desperate to get to an inadequate number of ticket windows. Into the fray I descended, urged on by my man from the hotel, pink safari slip in hand. I made the ticket window after some effort and pushed my safari slip through to the harried soul on the other side where upon I was told to wait until my name was called. Which I did, sandwiched like a sardine with Indian men pressing up against me on all sides. It may have been unpleasant except I couldn’t help think what a wonderful cultural experience it was. What a spectacle of disorder. After thirty minutes I received my prize – four seats on a ‘canter’ in zone 5, one of the lucky zones for tigers. The canter picked us up later that afternoon and we rumbled into the park. We whisked past spotted dear, samba dear, monkeys, peacocks, crocodiles and other creatures without more than a fleeting, bouncing, sideways glance. We were on a mission to get deep in to tiger country. These other curiosities were being reserved as a consolation prize on the way back. When we reached a cool, wet, grassy, green gorge in the dusty, rocky hills the canter halted and the guide did his best to keep everyone quiet while we sat and waited. I tried not to be disappointed. I knew it probably wasn’t going to happen. Alas, no tigers for us. The engine started up and we did a u-turn to head for home. And then. And then. And then. And then there were three other canters and a few gypsys all stopped up ahead looking into the grass. We stopped too and cast our eyes around before locking onto an orange, black and white stripy head protruding from the grass. My heart leapt and Amy jumped a little with excitement beside me. A tiger. It was a tiger. IT WAS A TIGER!! I couldn’t believe it. 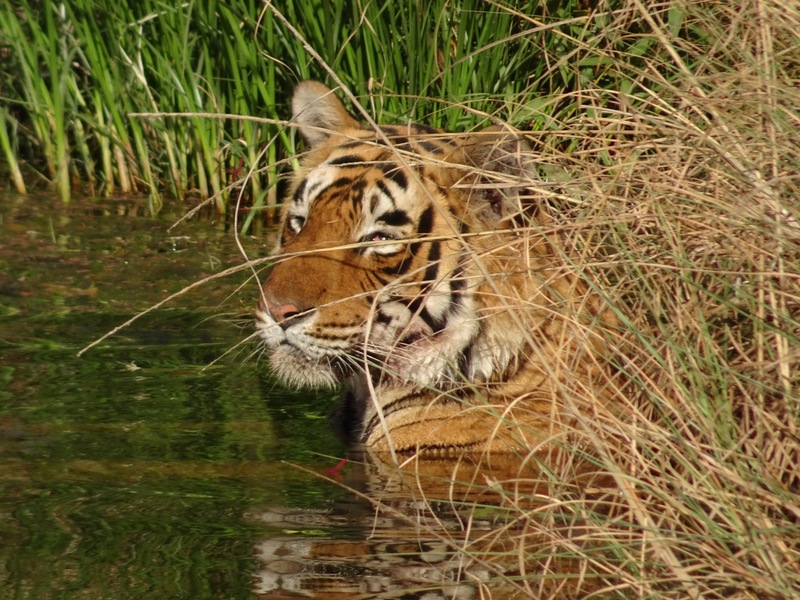 It sat there, in a pond of water fringed by grass, looking magnificent without really trying to. It just sat and watched oblivious to the 60 people staring at it, jaws dropped and cameras firing. For thirty minutes we watched as it swatted away insects with casual flicks of its head and paws before it slowly stood, turned and walked back into the tall grass. All eyes followed for as long as possible before it simply disappeared. We didn’t go on any more safaris. They are not cheap and we couldn’t see how the experience we had just had could be topped. We took the next day off. Playing in the pool, throwing a frisbee, doing school work and watching with amusement as the hotel staff used a hammer to smash the padlock off our hotel door when the key refused to work. The next day was Holi. We didn’t really know what to expect or even if we were in the right place to observe any of the goings on. We walked out into the streets hoping to see some colour and movement but unsure what we would find. 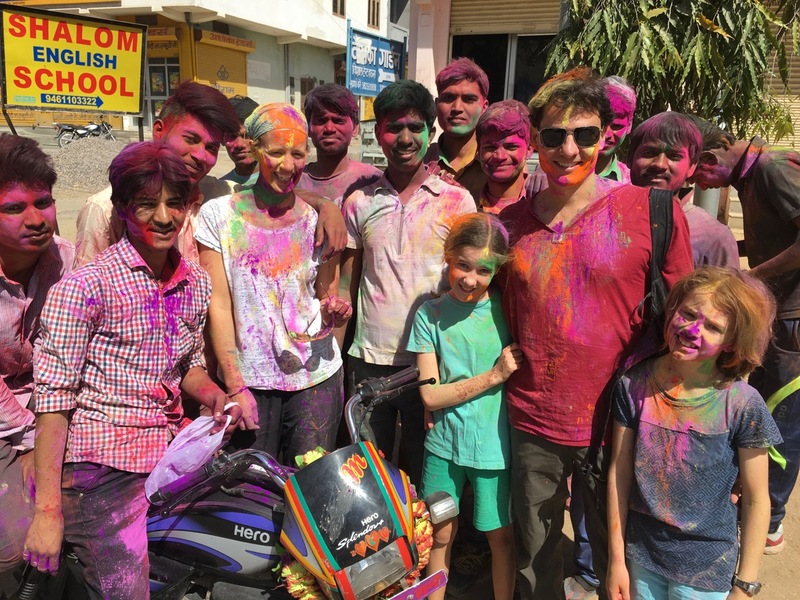 Within minutes we were coloured from head to toe by different groups of young men all eager to help a family of foreigners experience the fun. 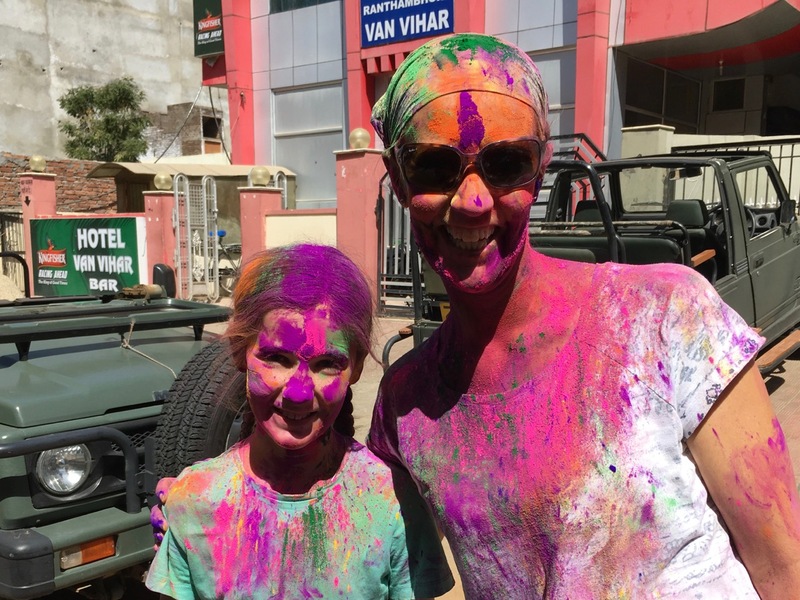 We never expected India to be an easy place to travel. I think that Emma and I felt it was a place we ‘should’ visit, if only to deepen our appreciation of the life we lead at home. I’m not sure that Australians, by and large and without wishing to generalise, do always understand what they’ve got. It would however be condescending to suggest that we have it better all round. There is beauty and vibrancy and life in this country which we first found so different and strange. It has been hard on occasion observing the discomfort felt by Emma, but more particularly Amy and Oliver – but does that mean we shouldn’t have come? I don’t know what Amy and Oliver will take from the experiences we have had so far, whether they are also taking in the beauty in the ruins. They have however now had exposure to how differently more than a billion people in this world live and this I hope will give them a broader perspective to chew over in the years to come. wonderful post. Coincidence met Kukki ji too. 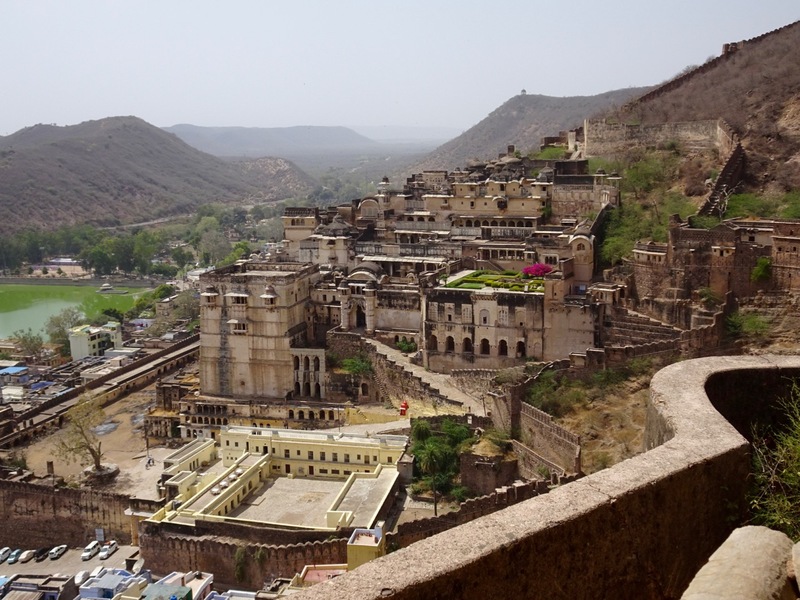 Bundi is Indeed a treasure ( and forgotten too) . Seen the same cave you have shown too.